The portion, Go Forth, begins with Abraham being commanded to go to the land of Canaan. When Abraham reaches the land of Canaan, the hunger forces him to go down to Egypt, where Pharaoh’s servants take Sarai, his wife. In Pharaoh’s house, Abraham presents her as his sister, fearing for his life. The Creator punishes Pharaoh with infections and diseases, and he is forced to give Sarai back to Abraham. When Abraham returns to the Canaan, a fight breaks out between the herdsmen of Lot’s cattle and the herdsmen of Abraham’s cattle, after which they part ways. A war breaks out between four kings from among the rulers of Babylon, and five kings from the land of Canaan, Lot is taken captive, and Abraham sets out to save him. 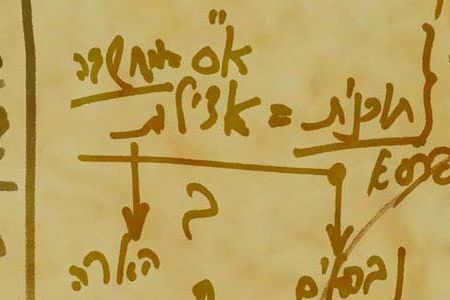 The Creator makes a covenant with Abraham, “the covenant of the pieces” (or “covenant between the parts”), which is the promise of the continuation of his descendants and the promise of the land. Sarai cannot have children, so she offers Abraham her maid, Hagar, and they have a child named Ishmael. Abraham makes the covenant of the circumcision with the Creator and is commanded to circumcise himself and all the males in his household. His name changes from Abram to Abraham, and his wife’s name changes from Sarai to Sarah. At the end of the portion, the Creator promises Sarah that she would have a son whose name will be Isaac. All the stories of the portion before us happen within us. In the correct perception of reality, this world does not exist, and neither do history or geography, nor the story of the portion. All of them are occurrences that take place within us. The wisdom of Kabbalah explains that perception of reality is a profound matter, relating to our innermost psychology, to our senses and to our physical structure. The Torah speaks the truth about the way we developed, and all the people and events that it describes are our mental forces. Abraham, for instance, is the tendency to develop toward spirituality, the desire to approach and discover the Creator. The story of Abraham in Babylon is really the revelation that only one force exists and manages the world, and the desire to discover that force. Anyone who feels the desire to discover who is managing one’s fate and why, or is asking, “What is the meaning of my life?” is at the same starting point of Abraham, and the force of Abraham is working within that person.